Much as I like the Octavia, I've always wondered why Skoda have been so slow in reacting to changing market conditions. 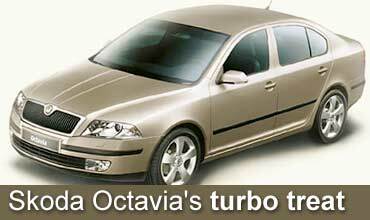 The current Octavia 2.0 petrol and 1.9 turbodiesel variants have been around for more than three years. They're good, capable cars, but going almost four years without any change is pushing it a bit. Toyota came with their brilliant Corolla 1.8 last year and took away some of the Octavia's thunder. Then, General Motors let loose the Chevrolet Optra 1.8 and 1.6, affecting Skoda sales even further. To counter that, Skoda has since launched the premium Laurin & Klement version of the Octavia, as well as the Rider, with a few upgrades. Now finally, they are ready with the Octavia RS 1.8 Turbo. No, that's not a turbodiesel, that's a proper petrol-powered, 20-valve, DOHC, turbocharged inline-four which displaces 1781cc. Just as God intended. There was an Octavia 1.8 T (in Laurin & Klement trim) parked in the Skoda factory when we went there this March, and as you might expect, I wanted to have a go. And the generous souls they are, Skoda said I could. Sooner or later I was doing what God, thankfully, intended me to be doing for a living -- driving a car to its limit. With 146 bhp and 21.3 kgm of torque, the Octavia would be giving the streets of Aurangabad some serious shredding. And doing that shredding would be the car's quartet of 195/65 R15 Goodyear Eagle NCT3s. Wearing these thick boots on its 15-inch alloys and painted in gleaming dark green, the 1.8 T looked purposeful. However, the model that we tested is stylewise different from the one that Skoda is launching. The RS gets an aggressive front end, xenon headlamps, a rear spoiler, a sunroof, leather/fabric combo upholstery borrowed from the Elegance version, and if there's a God above, a bright yellow body colour option. 2.4 i-VTEC or the Toyota Camry 2.4 VVT-i can say for themselves. And it shows. During testing, the Octavia hit 72 kph in first gear, 118 in second and was still accelerating when we hit 155 kph in third, before running out of road. With two more gears to go, I fully expect the 1.8 Turbo to hit 215 kph if you can find the road for it. Floor the throttle and the engine's meaty thrum and the whistling turbo egg you on. Dump the clutch and the acceleration does not disappoint. Not at all. The gearbox still feels a bit notchy, but I rather like its heavy, mechanical feel. It certainly isn't as slick as, say, a Honda City's shift, but feels right for this car. Once you get going, 0-60 kph comes up in 4.81 seconds and 0-100 takes only 9.10 seconds. These numbers are about half a second off the Corolla's, but due to lack of appropriate track, we were testing the Octavia Turbo on roads that were deserted, but also liberally strewn with gravel. Not the best thing when you want to avoid wheelspin and get the best acceleration time, you see. I can't wait to drive the car in Mumbai, where we usually test, and see if it will post slightly better times. Even if it doesn't, I'll admit I love this car to bits. I want one. And so will you, once you've driven it. Engine performance isn't of much use if the rest of the package isn't up to it. With the 1.8 Turbo, thankfully, it very much is. The Octavia has always had a competent chassis/suspension combination, which is happy being thrown around corners as hard as you dare. ASR is Skoda-speak for traction/stability control and it works extremely well. Usually, I'm a bit wary of electronic gizmoids cutting in while I'm having fun in a car, but ASR is not obtrusive -- it just gets on with doing what it's supposed to -- keep the car in the right trajectory. During some high-speed cornering -- only for pictures, believe me -- on gravel-strewn roads, I could feel the car begin to twitch and slide a bit, but then ASR would work its magic and without me having to apply opposite lock, the car would rocket down the road with unabated velocity. No lifting off the throttle, no arm-twirling steering corrections, no panic -- just high speed, steady-state cornering. I know it's beginning to sound like I'm fawning over the car, but it really is that good. Much as it might surprise you, the Octavia 1.8 Turbo shares its powerplant with the erstwhile Audi TT, which may also come to India sometime in the near future. The newest TT uses a V6, but the earlier one used the same 1781cc, 20-valve, DOHC, turbocharged inline-four which the Octavia has. Only, in the Ingolstadt coupe, this engine was in a different state of tune and used to make 225 horsepower -- 78 more than the Skoda. Apart from the TT, this 1.8 Turbo has also powered the VW Golf, the SEAT Leon, the Audi A3 and the 180 bhp, top-of-the-line Octavia RS, so we are certainly in good company! The engine, which offers great performance in the Octavia, features electronically controlled injection and combustion, 3-way catalyser, 5-valve distributor and a pressurised air cooler. There's also a dashboard diagnostic system which continuously monitors those parts of the engine that influence the composition of emission gases. And as soon as these values go beyond acceptable standards, a control light on the dashboard reminds the driver to visit the service shop. When it's launched, the Skoda Octavia 1.8 Turbo will be one of the most performance-oriented and technologically advanced cars around. I still think it's already a wee bit late in the day -- Skoda should have already launched this car by now. Still, with its combination of classy styling, an engine that's more powerful than competitors' bigger, more expensive D-segment cars, ride comfort, luggage space and handling prowess, the 1.8 Turbo makes great sense. At Rs 13.5 lakh ex-showroom Mumbai, definitely yes. Its time has finally come. . .